Sugar Candy is the Ultimate Lounge bra for fuller bust women. Patent pending, Sugar Candy is seamless, wireless and is primarily created from an ultra-soft, mercerised micro yarn for tensile strength, which enables unrivalled levels of comfort & support. Its intention is not to replace your typical wire bra, but to provide you with comfort & support at home. The Sugar Candy Bra comes in 6 easy sizes (XS, S, M, L, XL & XXL) to suit over 35 cup and band size combinations. Its strategically placed elasticated panels, supports and stabilisers provide for its capability to fit this wide range of size combinations. 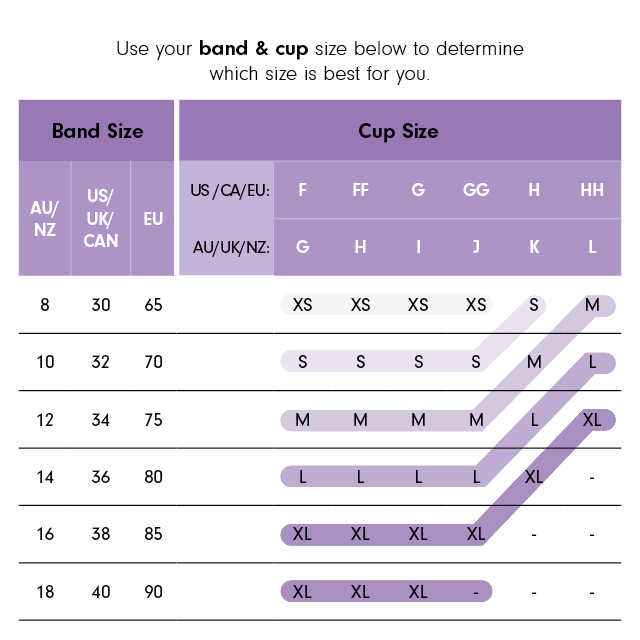 Refer to the size chart for more information.